We've had a great week playing with Mr. Potato Head! I feel so blessed to have gotten a ton of accessories from a Disney-loving family at a garage sale a few years. But most of these ideas can be done with a regular Mr. Potato Head! As you get a new body, part ask your kiddo where his own "eyes" or "arms" are! You can talk about your body parts, Mr. Potato's Head parts and your child's! You can talk about differences like your feet have 5 toes on each, while Mr. Potato only has 4 (if you have feet/shoes that show his toes!). You can also work on your child's naming abilities by showing a body part and asking "what's this!?" Or hold out two pieces and ask which one he wants and have him name the body part instead of just reaching out and taking it. Take it one step farther and talk about the sense and which parts do which sense. You change most nouns to plurals by adding "s" but some are irregular and are changed in totally different ways! You can use this opportunity to talk about how when we talk about one we say "foot" and when we talk about two we say "feet!" At a certain point, usually around 18-24 months, we want children to be using words more than gestures to communicate their thoughts and wants. Instead of pointing and grunting or making a noise, they should be using words. You can use Mr. Potato Head to work on naming new vocabulary items (purse, glasses, mustache, etc...) as well as combining two and three words together "I want eyes!" "pink ears, please!" This picture was taken seconds after Mr. Potato Head had thrown down the guitar when he was mad at his friend. You can have Mr. Potato Head make a bad choice and talk about what a better choice would have been. In this situation we worked on "just put it down!" You can do role playing with the Mr. Potato Head and your child to address social skills that he needs to work on! I love to work on contrasting pronouns when there are two "people." With Mr. & Mrs. Potato Head you can work on all sorts of pronouns. During play, you can use the possessive "his hat" or "her shoes" or you can create simple sentences "he has a hat" or "she has shoes." During clean up time, you can work on your child's comprehension skills. "Please give me her hat" or "Hand me his shoes next." I keep all of my pieces in baggies since I have lots of them so if they hand me something I'm not ready for yet, I hand it back and say "oh, I don't have the eyes-bag. I have the ears bag. Please give me her ears." When I'm working on a specific speech sound with a kiddo, I'll try to target 2-4 words throughout our play time. For example, in this situation if I were working on words that end with "n" I'd have him put MANY object "on" the characters. Notice the earrings on her arm?! We'd mention "green" multiple times and pass the "balloon" back and forth multiple times so we could practice "n." I'd also name them fun names like "Dan" and "Dawn!" I find it helps to have a word list to work from and then figure out how to use some of those words in our play activity. There are so many more communication skills that you could work on! Turn taking, sharing, repeating sentences, problem solving, answering "wh" questions (why does she need a hat today? ), sequencing a familiar activity, making up silly rhyming words while you are putting the items on Mr. Potato Head, etc...! I hope that you pull out (or go buy!) a Mr. 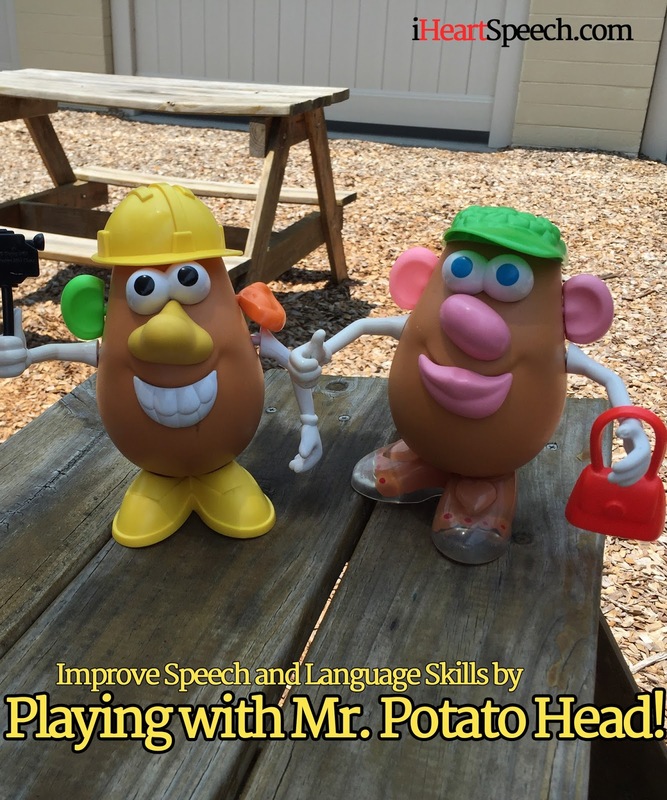 Potato Head to enjoy with your child while you play together to improve speech and language skills! Just a tip...if you are in the central Florida and you head down to Disney Springs, there is a huge Mr. Potato Head accessory station where you can fill up a box of pieces for not very much money! Buy the head at a big box store for a few dollars and get some super cool Disney accessories to add variety to your play time! "Doh" you want to play?